There’s been a bit of a hubbub around the Mac Web about “problems” with Apple’s MacBook line of notebook computers. But as Jason Snell wrote last week, it’s difficult to figure out what’s actually a widespread problem and what’s merely the concerns of a few (understandably) unhappy people, suffering from isolated issues, amplified by the echo chamber that is the Internet. We can confirm only the experiences we have ourselves, and, so far, our experiences with the MacBook line have been quite positive. The only real problem I found with the new design is that the smooth top of the keyboard enclosure doesn’t extend quite to edge of the MacBook, creating a thin, rough-feeling bevel between the top and bottom of the case. Though it’s thin, the rough edge of the polycarbonate bottom running all the way around the MacBook irritates my palm when I slide my hand around to use the track pad, and it feels rather sharp if I rest my hand on it. your MacBook’s sharp bottom edge is actually comfortable. Second, in my testing, Softpads were thin enough that, although they really did feel like pads , they didn’t interfere with the proper closing of our MacBook’s lid. 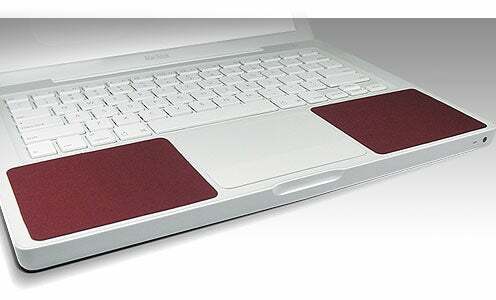 Finally, every set of Softpads includes a thin, microfiber cloth for cleaning your laptop’s screen. Now, granted, we’ve been using Softpads on our MacBook for only a month or so; it’s possible that over extended use at the very edge of your MacBook’s wrist-rest, the bottom edges of the Softpads may get worn down and lose their ability to soften this corner. But right now, the bigger issue with Softpads—realized only after I’d nearly finished this article—is that I can’t seem to find a U.S. retailer that carries them. AVA has distributors, and several retail stores, in Asia, but the company’s products currently aren’t available in the U.S. Based on my conversations with company representatives, AVA is in the process of setting up U.S sales; I’ll update this article when that happens. (If you’re seriously interested in Softpads, you could could also contact the company to encourage them to make the product available in the U.S.) I apologize for the tease. If it’s any consolation, I was looking to buy another set myself.